Not a lot of comments on Hillaries faith..yeah i don't believe it either. "In the Bible it says they asked Jesus how many times you should forgive, and he said 70 times 7. Well, I want you all to know that I’m keeping a chart." Same, you have a fairly common position. But you are vastly outnumbered by those of us who believe. You'd best learn to live with it. Majority doesn't make it true, it just means there are many gullible people in this world. So you won't be voting for Hillary then. Can you prove him wrong? Try not using your bible to do so. How do you "choose" to believe something? Either you're convinced that something is true, or probably true, or you're not, right? You can not use the only book that defines sin to defend sin, that is circular reasoning and fails. You cannot claim to know the "law of god' since you cannot show there are any gods. The bible was written by men, and in it they make claims of what god wants, but really have no idea if there are any gods, or what they want if they exist. All you have is men say go said. Nowhere do you have anything god said. tp and ig; you are both wrong but i believe I was replying to SS. Also you may want to check your Webster's and I can use any book or reasoning I choose to since everyone else does here. Sin is whatever the Bible decides to label something it doesn't agree with. It's not the same as "immoral" since much of what is in the Bible is immoral by today's more educated standards. jh: You're right...you can use it and in doing so you deserve the scrutiny that comes with it. It is illogical to use the book that identifies sin to defend sin. Outside of your belief system sin does not exist. tp; you have not gone to Mr.Webster yet have you? Also I believe it was Mr. Stone that was commenting on sin and I was just referring to him but the Bible is not the only book that refers to sin or lawbreaking which I compared it to. How exactly am I wrong? Men DID write the bible, there is no evidence of god, and as far as god having anything to do with the bible, there is just as much evidence that satan inspired the bible. No one has ever shown any gods to exist, and man has a long history of creating gods (thousands of them). All you have in your book is men saying god said this or did that, but NOWHERE did god put one word in the bible. Men put all of them there. To attempt to use the bible to verify the claims of the bible is circular logic, so does not work. You cannot use the source to verify the source. ob; I saw your comment and do not believe what I think you are saying but agree "sin" is not equal to immorality. just under the same umbrella. Why bring satan into this? Why not...he is also a character from your book, and I am correct that there is just as much evidence of satan inspiring the bible as any gods...same exact evidence which is absolutely none. No I am not using the bible, just one of the characters from it. Every word was put in the bible by men, and there is no evidence of anything other than men influencing the bible. So again, how am I wrong? yeah, pretty sure jesus would be VERY pro-g.ay marriage. The story I have is he was married, the Christians don't like that one either, can't make them happy. He either was a man or he wasn't, he either had a wife or a cute boy friend the way I see it. Where do you get your info from? Jesus did not have long hair, the bible teaches in 1st Corinthians 11:14 that it is a shame for a man to have long hair. Where did people ever get the idea that Jesus had long hair or portray him as some effeminate looking girly looking person, not even close. A little study from the bible will tell us how he looked. Google..
Are you blind? Geez, how the hell do you miss the numerous pictures depicting this character having long hair? Now, I understand that the bible is your primary source for education and information but if you go to evilbible.com you can get information that shows why you are wrong on it and why the book is fallacious. An education is a wonderful thing...start with some basic science courses, maybe watch Cosmos. Read your bible at face value...it is the quickest path to disbelief ever and once you drop the horrific belief system in that vicious god, you'll live a more fulfilling life-one without fear of that god. Paul was probably just giving his opinion there as one raised as a Roman citizen speaking to gentiles. But where would HC be without that zipper-down Billy "Boy"? Just another hick lawyer from Arkansas !!! Time to cleanse Washington of all the Texas and Arkansas power-playing families !!! What would you be with out your inherent sexism and blame the victim mentality? As irrelevant as you are now. She is much, much smarter than to remain a "hick" lawyer (nice slur at Arkansas, snob)...she was destined to be a powerhouse with or without Bill. So don't vote for her. Problem solved for you. i wonder what she thinks of jesus telling slaves to obey their masters if they want any chance to get into heaven or that disobedient slaves be beaten. jesus said some great things about love and kindness, but he said very contrary things too. people cherry-pick instead of looking at jesus' words in their entirety. some of the things he said were great, and some awful. HCR is smart? By what measurement? Marrying Zipper Down Bill as per your analysis was a dumb thing to do as she could be a power house without his anchor around her neck. 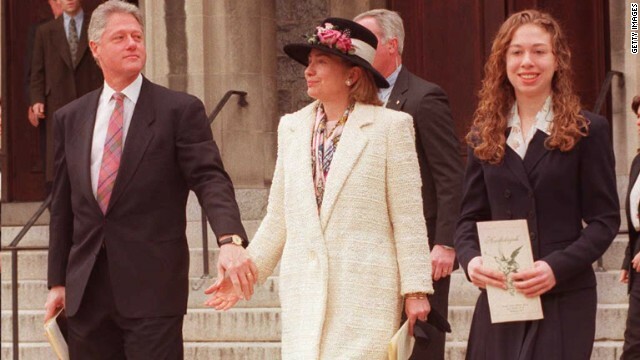 I know that in your hurry to bash HRC, per your wrong analysis of blame the victim and sexist remarks, she married Bill for love, not for what you, in your fever dream, imagined he could do for her. My "analysis" isn't that she shouldn't have married him. I SAID, (that you twisted because you have no case, and you left out your bashing of Arkansas) she would have been a powerhouse with or without Bill. Really, I know you don't like her, but do try to make a rebuttal without lying, mmmkay? And somehow you know she married "Zipper Down" Bill for love. Please provide reputable data on this. Jesus didn't say that, but he did strongly suggest that you obey him. "Slaves, obey your earthly masters with deep respect and fear. Serve them sincerely as you would serve Christ." So, you believe that we should judge people in history by our lives today? That really isn't the purpose of history, we study history to understand their motivations, not to judge their actions. We should judge our actions by what we have learned from history. Jesus did not say for slaves to obey if they wanted to get to heaven. The bible teaches us in John 3:13 that no man has ever ascended into heaven, why do people contradict him and say otherwise? Acts 2:34 tells us that even King David, a man after Gods own heart never ascende into heaven, why do some teach when we die we go right to heaven? What is the truth? Where can we find it? It's all there in the bible but some just like to believe what others say without checking. Did Booty say that Jesus was promising to get people into Heaven right away? Besides, there's that stuff about Enoch, and Elijah was taken to Heaven, right? HC thu-mps Mark 6 : 30-44 but did the historical Jesus utter these passages or is it another invention by this fellow Mark who we know very little about? Tis invention based on the studies of many contemporary NT scholars e.g. "The formation of this story derives from the needs of the community. Its historical value is nil. Anyone is free to accept the table fellowship of Jesus and his followers as a starting point for the rise of this story. But that is rather different from the feeding of the 5000. " "Meier [Marginal Jew II,966] suggests that the Gospel stories of Jesus feeding a mult-itude preserves a tradition about "some especially memorable communal meal of bread and fish" but does not think it possible to offer a judgment on whether anything miraculous was involved in the meal event. See pp. 950-967 for his complete discussion." HC should be more thorough in her research before uttering obvious fiction as it does reflect upon her ability to lead. And of course you have said the same exact thing about every other President, right? That their faith impaired their ability to lead? definitely not true with all pols, but take george w. bush for example. he thought he was on a mission from god. and that's dangerous. Bush did use that as justification. And he was dangerous, but Cheney is infinitely more so. The fastest growing voting demographic: The 70 million "mothers and fathers of aborted children" whose ranks grow by two million per year. (i.e. the Immoral Majority). They easily put Obama in the White/Blood Red House!!!! And no doubt, HC will likewise win the presidency in the same fashion if she wins the nomination. Mea culpa. Should have said "candidate", of which HRC isn't, either. So, excepting that one mistake, my post remains the same: of course you say/said the same thing for every candidate: that they are unfit to hold office because they believe in God. You did, didn't you? Right? They easily put Obama in the White/Blood Red House!!!! Hyperbole alert. Gratuitous use of exclamation points detected. But the eye witness accounts carry far more weight that some guy guy guessing 2010 year later. No they don't, not when they can't be verified and it is pure ignorance of you to say so but given your other responses on this blog, you seem to take pride in being an ignorant dolt-GROW UP. 4000 fed with 7 loaves and 2 fish, or 1000 more fed with 2 less loaves? Or both? Isn't this like arguing how many caddies Elvis gave away in his lifetime? So all of the people who witnessed Harry Potter playing Quidiche should be believed, right? And the "I am a Christian" presidential PR campaign continues. Give it another 24 years and it will be a "I am an atheist" presidential PR campaign. And that will be a good thing !!! Shrug. They all do it. It's not as if this is some sort of new tactic. I want to live longer Vic. happy to say no one lords over me. Sam, Jesus Christ rose from the dead, and appeared to his disciples and others. These disciples, having seen the risen Christ, gave their lives in extremely painful ways. Had Jesus not been raised, they never would have willingly suffered such fates. But after 3 days, some didn't recognize him at first. Many people die for a cause they believe in. It means they're fervent in their belief, but that doesn't make the cause true. Considering nothing was written about jesus until 30-40 years after he apparently died, it is hard to rely on the stories. Stories get embellished over the years. What we do know is that people don't come back from the dead after 3 days (show us one other verifiable account in history without using a holy book of it happening). observer Jesus had been severely beaten and scourged by the Romans, he was covered with scabs and cuts, which is why he wasn't recognized. TruthPrevails1 it's not like there were a thousand newspapers or like the paper was as durable as it is today. You really don't know what was written, you only know what survived after several centuries. John was an eyewitness as was Peter. James was Jesus' brother and wrote about him. nclaw441 – "...gave their lives in extremely painful ways"
You realize those stories are unverified legend and tradition, right? "Had Jesus not been raised, they never would have willingly suffered such fates." That's actually a very relevant fact. Except for John all of the apostles died martyr's deaths. Many people have died martyr's deaths because they believed in something, but no one has ever voluntarily given their lives for something they knew was a lie. The apostles walked with Jesus for three years, they knew the truth and died without renouncing it. StevePage – "... no one has ever voluntarily given their lives for something they knew was a lie." How do you know that? Obviously someone who is dying for a lie has some reason to keep the truth from being revealed, so they wouldn't be announcing the truth as they die. "Many people have died martyr's deaths because they believed in something, but no one has ever voluntarily given their lives for something they knew was a lie." First, I think people do sacrifice themselves for what they know is a lie. For example, confessing to a crime that a loved one has committed or protecting people or secrets by lying, at the cost of one's life. All that's seems to be needed is the belief that the good outweighs the lie. Second, even if the Disciples believed what they preached that doesn't make it true. Many people have died for causes they believed in, but that we consider lies, or false, e.g. People's Temple, Branch Davidians, Heaven's Gate, etc. "In 1666, Robert Hubert confessed to starting the Great Fire of London by throwing a fire bomb through a bakery window. It was proven during his trial that he had not been in the country until two days after the start of the fire, he was never at any point near the bakery in question, the bakery did not actually have windows, and he was crippled and unable to throw a bomb. Nevertheless, as a foreigner, a Frenchman, and a Catholic, Hubert was a perfect scapegoat. Ever maintaining his guilt, Hubert was brought to trial, found guilty, and duly executed by hanging." " You really don't know what was written, you only know what survived after several centuries. John was an eyewitness as was Peter. James was Jesus' brother and wrote about him." Right, I don't know what was written, nor do you! Actually the gospels original authors are not known. Given how often the bible has been translated, it is very difficult to know what holds truth back to the originals. What we know is that numerous men wrote that bible and very few of them had actually met one another. Like many good fairy tales, this one (the bible) was built upon. Communication is our main source and back in the day when the bible was written, very few had the ability to write but what they did have ability to do was pass down stories via verbal communication, a long the way those stories become embellished. Sadly Christianity is a con-game, we've always had someone who knew exactly what it would take to pull a fast one over people...people can be gullible. Christianity offered a false cure (heaven) if only you believed and if you didn't, these con men placed fear in to you by making you believe you'd suffer eternally in a horrible pit of fire. It's simply ludicrous to take that book as anything more than the ancient ramblings of uneducated primitive men. There's a reason the USA is falling behind in education and Christianity is a good part of that. Proof Sam, show us positive proof Jesus is a myth. How exactly does one go about proving a negative? Common sense ben-USE IT!!! Education ben-GET ONE! I knew you couldn't, all you can come back with is a smart remark, I think you are the one who needs to be educated. You knew what you asked was false when you typed it, Ben, so why did you? That's kind of trollish. He can't because Jesus did exist. benhoodynote it was Sam who made the claim that Jesus is "mythology" so by his own words the burden of proof is on him not you. "Sorry benny but the burden of proof lies on the one making the claim not the one asking for it." If Sam finds it impossible to "prove a negative" then we can rest assured that Sam just spouts of about stuff he can't validate or prove. Therefore Sam is irrelevant. No Steve, let me break this down for you in terms you can comprehend given your extreme level of ignorance. What sam has basically said is that he doesn't believe jesus existed (he joins 5 billion other people on this planet in that opinion); ben and you say jesus does exist; given that you claim he exists it is up to you to prove it. Burden of proof lies on the one making the positive claim not the negative claim given that you can't prove a negative. You can claim jesus exists all you wish and until you provide verifiable evidence outside of your bible, we will call you on it. I'm sorry 21st century living hurts you and I'm sorry the education system and your parents failed you. "no one has ever voluntarily given their lives for something they knew was a lie"
"Sam just spouts of about stuff he can't validate or prove. Therefore Sam is irrelevant." Sam you are laughable. Jesus is a historical figure and that's fact. Try studying the subject before saying stuff that's proven to be false. Historical maybe but all the other bs that goes with it, highly unlikely. Pull your head out of the first century and reside in this one. If jesus existed, he was a mere man..no miracles performed, no resurrection (only a fool believes that garbage)...not a thing was written until 30-40 years after his death and thus it is not reliable (regardless of what you preacher tells you). Steve: And you are a chump. I am not questioning the historical jesus. You sure have a twisted view of "facts"
There is plenty written about Jesus in Roman and even Babylonian writings my friend. For those who actually would like to learn more, who are actually serious about looking for the truth, there is much to found on this subject. Just Google historical accounts of Jesus. Steve your statement is not true, you need to get your information from somewhere else other than your fundamentalist preacher. There are a few writings in India about him but it could have been someone else just as easily. The Cult that Jesus belonged to as a Jew large and there were many traveling healers and ascetics that came out of the Essene cult. You really should remove the hyper-link in your alias, otherwise it makes you look like you're stealing advertising space on CNN and according to your book of fiction theft is a sin and you will be tortured in hell for that-such a bad Christian. You've also violated the terms and conditions of CNN by being a thief.